PRO X REGULAR brings the aspect of polymerization and MRCC technology by bonding our formulation to .. PRO X Freehub Oil using our MRCC Micro Resistant Complex Compounds has improved on our original free.. PRO X Liquid Grease is highly recommended for steel and ceramic cartridge bearing. Water proof which.. PRO X LITE brings the aspect of polymerization and MRCC technology by bonding our formulation to the.. PRO X Freehub Grease, using our MRCC Micro Resistant Complex Compounds, is specifical.. PRO X Freehub Grease performs in a broad temperature range from the summers heat to the extreme.. 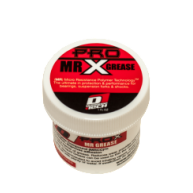 PRO X MR Grease uses polymerization to create a barrier of grease at the contact points which r..